What happened to Charleston Place? Back in the late summer of 2012, the City of Langley made a great do about Charleston Place. This was a proposed 15 storey, mixed-use building that was to be built on the corner of Industrial Avenue and 203rd Street. The City highlighted this project in all of its marketing martial for some time. 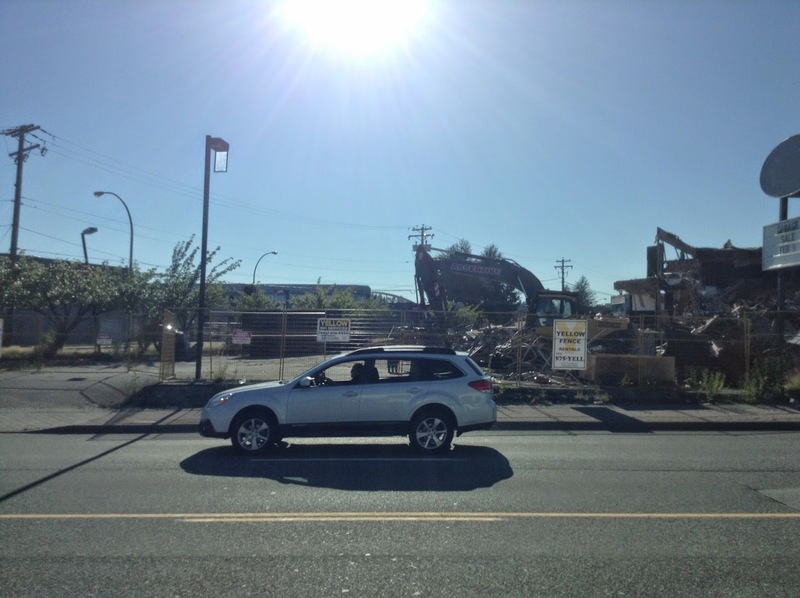 I was excited that a major, mixed-use project was coming to Downtown Langley though I did have some concerns. Because the City of Langley is a great value for both residential and commercial space, I wondered if the project would be financially viable. Some friends of mine that work on larger development projects told me that the project didn’t make financial sense. I wondered if this was it for Charleston Place. Demolition work at the corner of Industrial Avenue and 203rd Street. Picture taken on July 30 in the later afternoon. Another view of the demolition of the old night club at Industrial Avenue and 203rd Street. 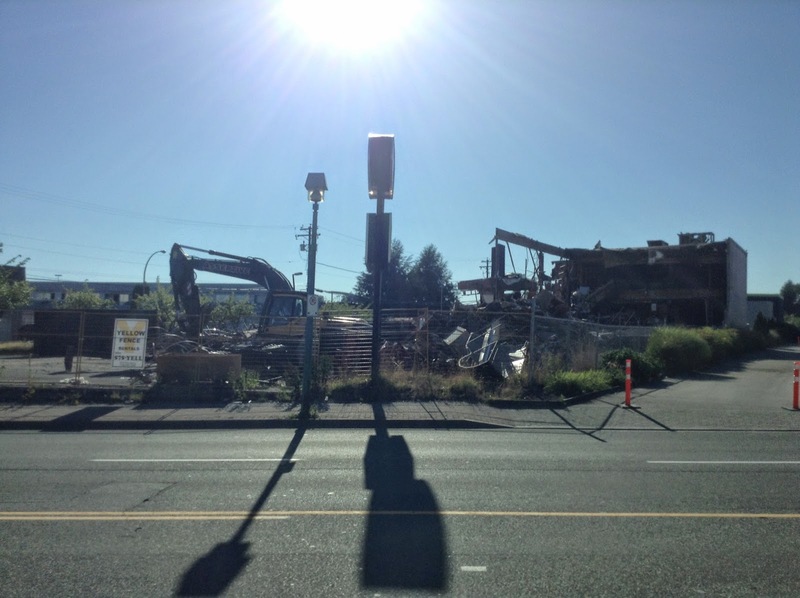 Earlier this week, crews started demolishing the old night club at the corner of Industrial Avenue and 203rd Avenue. Is Charleston Place ready to re-launch, or is the land being cleared for a potentially different type of development? Other developers have come to Langley proposing one project, but switched to another project later on. For example, a strip mall was proposed to be built at the corner of Glover and the Langley Bypass, but was changed to auto dealerships. I will continue to monitor what is going on with the former Charleston Place site. Hopefully we don’t get another drive thru! In 2008, City of Surrey Council adopted the Surrey Sustainability Charter. This charter, like an official community plan, is a key document that guides how the City operates and how it plans for the future. The Surrey Sustainability Charters is based on three pillars: economic, environmental, and social-cultural. While it is great to have sustainability charters, they aren’t very useful if a city and its council ignores the charter. Also since sustainability charters normally contain long-term goals, it is very important to be able to track the progress towards these goals. One of the great things that the City of Surrey has done is create an online Sustainability Dashboard. The dashboard contains both the long-term goals from the Sustainability Charter, and reporting on the City’s progress towards these goals. There is certainly room for improvement in Surrey. Because Surrey reports back on its progress towards sustainability goals, it can target areas where it isn't meeting those goals. Using the Sustainability Dashboard, I found that the City of Surrey spent around $300k on public art in 2008 and around $600k in public art in 2013. A significant increase in residential garbage diversion from 38% in 2007 to 68% in 2013 with the introduction of the organics waste collection program. An increase in active transportation infrastructure with over 100 kilometers of greenways, park paths and trails, and cycling trails added since 2010. Between 2006 and 2013, that has been an increase of more than 560 social housing units, as a result of the construction of additional units of supportive/transitional housing units. Early achievement of the target for accessibility of bus stops, with 76% of these stops meeting accessibility criteria in 2013. Ongoing decreases in average daily residential water consumption, due largely to the City’s water metering and behavioural change initiatives. Continued high levels of volunteering, with 4,000 volunteers noted in 2013. A steady increase in the number of registered arts and culture groups with Surrey Arts Council, and the number of cultural business licenses in the City. You can view data from 2008 to 2013 at Surrey’s Sustainability Dashboard website. When compared to regions of similar size, TransLink ridership surpasses even Portland, Oregon which is a transit leader in the US. Because of the investment in transit service in Metro Vancouver, frequent transit service is available in all parts of the region. People who live in Langley can use transit to get from the Carvolth Park and Ride to Downtown Vancouver in about an hour. Because of the Canada Line, a one-way trip from Vancouver to Richmond only takes 25 minutes. The Evergreen Line, which will be complete in 2016, will allow people to travel from Coquitlam Town Centre to Lougheed Town Centre in under 15 minutes. From one end of the region to the other, individuals have multiple transportation options. While Metro Vancouver has shown the world how to deliver transit service, there is currently no funding to improve transit service in the region. Worse still, according to the independent TransLink Commissioner, transit service will slip to 2005 levels over the next decade even while our region’s population continues to grow.7 In fact without new funding, transit service will deteriorate in our region and we will lose our status as a provider of world-class public transportation. 1South Coast British Columbia Transportation Authority. 2009. How big is TransLink’s service area? September 17. Accessed December 27, 2013. http://buzzer.translink.ca/2009/09/how-big-is-translinks-service-area/. 3American Public Transportation Association. 2012. 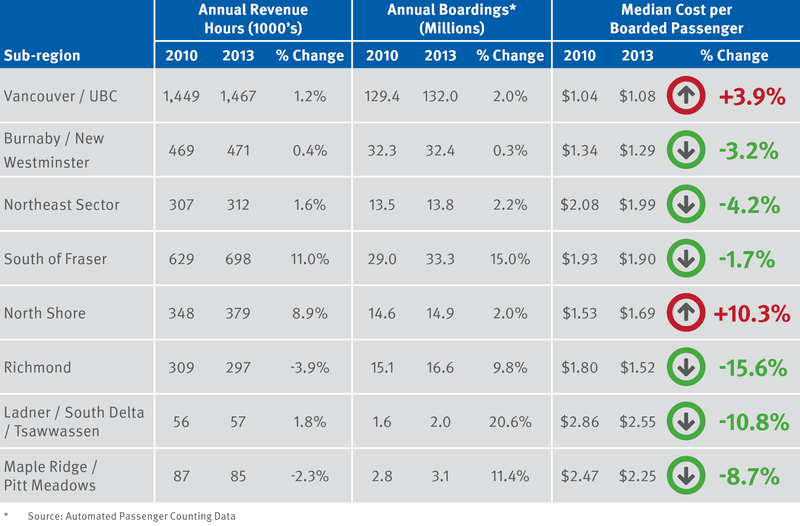 Public Transportation Ridership Report – Fourth Quarter 2012. March 1. Accessed December 27, 2013. http://www.apta.com/resources/statistics/Documents/Ridership/2012-q4-ridership-APTA.pdf. Canadian Urban Transit Association. 2012. CUTA 2012 Transit Fact Book. 4Central Puget Sound Regional Transit Authority. 2008. Sound Transit 2. July 10. Accessed December 27, 2013. http://www.soundtransit.org/Documents/pdf/st2/transitexapansion/ST2_Plan_web.pdf. 5Los Angeles County Metropolitan Transportation Authority. 2012. 30/10 Initiative. April. Accessed July 29, 2014. http://www.scribd.com/doc/89890814/30-10-Intiative-Project-Acceleration-Methodologies. 6Los Angeles County Metropolitan Transportation Authority. 2008. Proposed One-Half Cent Sales Tax for Transportation - Outline of Expenditure Categories. August 13. Accessed December 27, 2013. http://media.metro.net/measure_R/documents/expenditure_plan.pdf. 7TransLink Commission. 2013. Report of the Regional Transportation Commissioner On TransLink's 2014 Transportation and Financial Base Plan and Outlook. November 29. Accessed December 27, 2013. http://www.translinkcommission.org/wp-content/uploads/2013/11/Base-Plan-Report-final-.pdf. The average age of Canadians continues to increase. The large Baby Boomer generation, born between 1946 and 1964, will be entering retirement in droves over the coming decade. With this in mind, both the City and Township of Langley have unique challenges to ensure that seniors can maintain an independent, high quality of life. The City of Langley has a significant population of seniors. 4240 seniors —17% of the population— called the City of Langley home based on the latest census data. About 30% of seniors live in or next to Downtown Langley. 42% of seniors live alone. In the Township of Langley, the senior’s population continues to rise. 22% of seniors in the Township live alone. Unlike the more walkable and compact Downtown Langley, due to the Township’s large size and more auto-oriented design, many seniors living alone are not close to any community services. These seniors are at a high risk of social isolation. Building walkable, accessible communities that support all generations is key, and particularly helps seniors. Over 70% of seniors have some form of disability. Besides building accessible communities, it is important that there are community services available for seniors. Many people in Langley think that seniors are generally well-off both financially and socially. This is not necessarily the case. Seniors living in poverty, without a support network of friends and family, is a real and growing issue. In Langley, we have the non-profit Langley Seniors Resources Society (LSRS) which provides services to seniors in both the Township and the City. The LSRS has a facility in the City of Langley. They provide recreational opportunities to seniors including fitness programs, social programs, and educational workshops. The Society also has an outreach department which focuses on getting frail and isolated seniors the support services they need. The LSRS also hosts an Adult Day Program for all adults living with physical and mental disabilities. In additional, the LSRS has a food program which provides seniors with access to affordable, healthy food options. Many seniors do not have the skill set or even money to eat health on their own. I’ve seen some seniors in Langley trying to live off a can of soup a day; senior’s poverty is a real concern. I suggest that you check Langley Seniors Resource Society website for more information about their services. In 2013, the LSRS had $2 million in revenue. While the City of Langley did recently pay of the Society mortgage for their facility, the City and Township provide $0 in on-going operational financial support. The LSRS recently requested that the Township of Langley contribute $40,000 to support seniors outreach and recreation services to that community, and support society membership subsidies for Township residents to access LSRS services. With the amount of services that the Langley Seniors Resource Society provides, and with all the talk about creating age-friendly communities by many politicians, I was a bit surprised to that there appears to be little local government financial support for this organization which plays a vital role in the community. Yesterday, I was on CBC Radio One’s On The Coast talking about SkyTrain and TransLink. I talked about how the lack of long-term funding for transit in our region has forced TransLink to “optimize” transit service, doing more with less. I talked about how it leads to a less resilient system, so when one part of the system fails, the ability of the rest of the system to compensate is reduced. I also talked about the need for TransLink to improve its communication when transit service is disrupted, including how to prevent people from breaking out of trains. I’ve embedded yesterday's show in this post, this interview starts at 0:07:30. Transportation systems have a profound impact on the design of our communities. Carvolth, in the northern section of Willoughby in the Township of Langley, was slated to become an area full of auto-oriented office parks. Because of the construction of the Carvolth Park and Ride, and the introduction of higher-quality transit service like the 555 express bus to SkyTrain, the Township updated the plans for the area. Carvolth is now transforming from a first-generation suburb into a transit village. Due to the changes to the area’s plan, the Township received a rezoning application for a 9.4 acre parcel of land between 86th Avenue and 84th Avenue, just east of 200th Street. Proposed site plan included with rezoning application for land between 86th Avenue and 84th Avenue, near 200th Street in Carvolth. Select image to enlarge. Along 86th Avenue, which will become a mixed-use, high street, the rezoning applicant is proposing to construct a 6 storey building that will included 15,000 square feet of commercial on the ground-floor, plus a possible hotel on the upper floors of the building. 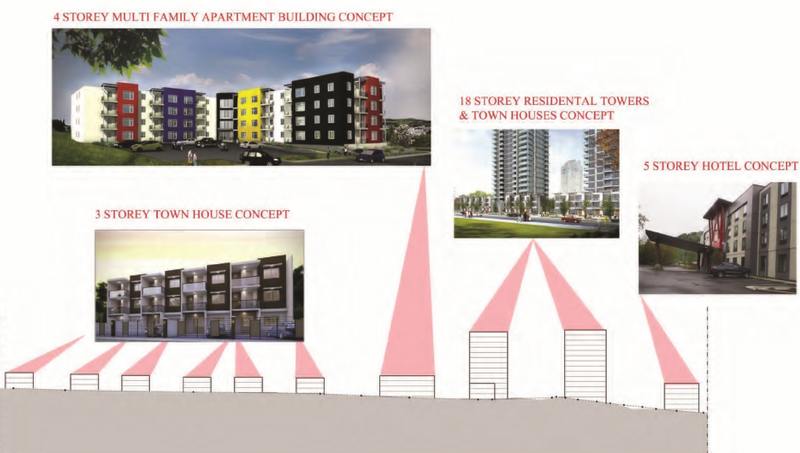 In the area around a future 85th Avenue, the applicant is proposed to building two 18 storey apartment buildings with 3 storey townhouses at their base, plus a 4 storey apartment building. In the area near 84th Avenue, the applicant is proposed to building 3 storey townhouses. Proposed height and concept for various buildings included in rezoning application. Select image to enlarge. If the project gets developed, the Township will require a 4.5 meter greenway to be constructed along 84th Avenue as part of this project. If this redevelopment application gets approved, development permits gets issues, and construction actually begins, this proposed project will lay the groundwork for other projects that will support the creation of a walkable and accessible transit village in Willoughby. I look forward to seeing the actual proposed design for the project. It has been a rough few days for transit riders in Metro Vancouver. On Thursday, the SkyTrain system was shut down during the evening peak travel period due to a failed computer component. This left many passengers stranded both at SkyTrain stations and in SkyTrain cars for up to five hours. This was really bad, but the system was repaired and service restore. I don’t say this lightly; I’m very grateful that no one died due to the failures that shut down the SkyTrain system on Thursday and Monday. Other transit agencies, like Toronto’s TTC, have had people died when system failures occurred. The SkyTrain system is very reliable —TransLink claims the system has 95 on-time performance— who could have predicted that there would be two system meltdowns within four days? Luckily on Monday, the failure occurred during lunch, and TransLink was able to have service restored for the majority of the evening peak travel period. I was impacted by both Thursday’s and yesterday’s shutdown, but I’ll get to that in a moment. During the system failure yesterday, I saw some truly silly comments from the anti-tax, anti-transit crowd saying that if TransLink didn’t have a new head office, executive staff, public arts, police, or a facility to refurbish old SkyTrain cars, there wouldn’t have been a system failure on Thursday or Monday. The implication was that TransLink was spending money on these items instead of keeping the system in a state of good repair; this couldn’t be further from the truth. I take the SkyTrain from Surrey to Main Street Station at least five days a week, and sometime after 8pm. Because TransLink is replacing the power rails along the entire Expo Line to keep the system a state of good repair, it takes me an extra 15 minutes to get home if I’m working the late shift. On top of that, TransLink is also rebuilding Main Street – Science World SkyTrain station due to its age. This means that I have to transfer to a special shuttle train which adds another 10 minutes to my commute. I’ve also ridden in the refurbished older SkyTrain cars. TransLink is refurbishing, and not replacing, the older SkyTrain cars to extend their service life. This costs less than buying new cars while still improving the reliability of the system. I have certainly been impacted as TransLink works to keep the SkyTrain running, so when I hear people claim that the SkyTrain failures of the last few days are due mismanaged priorities, I have the question the creditably of the people making these claims. Ironically, the people campaigning to strip TransLink of funding in the name of efficiency may be responsible for the time it took to get service restored and get people moving over the last few days. What should be apparent from the last few days is that having a resilient transit system is important. When the SkyTrain was shut down on Thursday, I was able to take the West Coast Express to get back to Langley. During yesterday’s SkyTrain shutdown, I was able to take the new B Line from Surrey Central to Netwon, catch a bus on the frequent transit network to the new South Surrey Park and Ride, then take an express bus to the Canada Line. I was only 30 minutes late for my work which is near the Olympic Village in Vancouver. Due to the provincially mandated requirement to become more efficient, TransLink has reduced the resiliency of the system. For example, TransLink didn’t purchase a $20 million backup system that may have allowed SkyTrain service to be restored faster on Thursday. Also, TransLink doesn’t have the long-term funding to pay for the over $1 billion in upgrades that will be required to keep the SkyTrain from becoming overcrowded and running as reliably as possible over the coming decades. TransLink has tightened up the amount of spare buses and staffing on the bus network. This means that when emergency bus service is needed, there are fewer people available to drive these buses, and few buses available. Running an efficiency transit system is important, but should transit service be optimized at the expense of reliability? I will say that TranLink does need to review how it communicates information to customers during a SkyTrain shutdown. I have posted about this in the past, and moving forward, I hope TransLink will work to improve how it communicates to customers during a discontinuation of SkyTrain service. This includes simple things like providing information about where to catch a bus bridge. Over the last week, the whole region has been made aware of the important role that transit plays in getting people around Metro Vancouver. A well-funded transit system is critical for the livability of people who live in our region. Every few years, the City of Langley releases statistical profiles for the various neighbourhoods in the community. These neighbourhood profile areas are based on the location of elementary schools in the City. Land-use map from City of Langley Official Community Plan. Select image to enlarge. 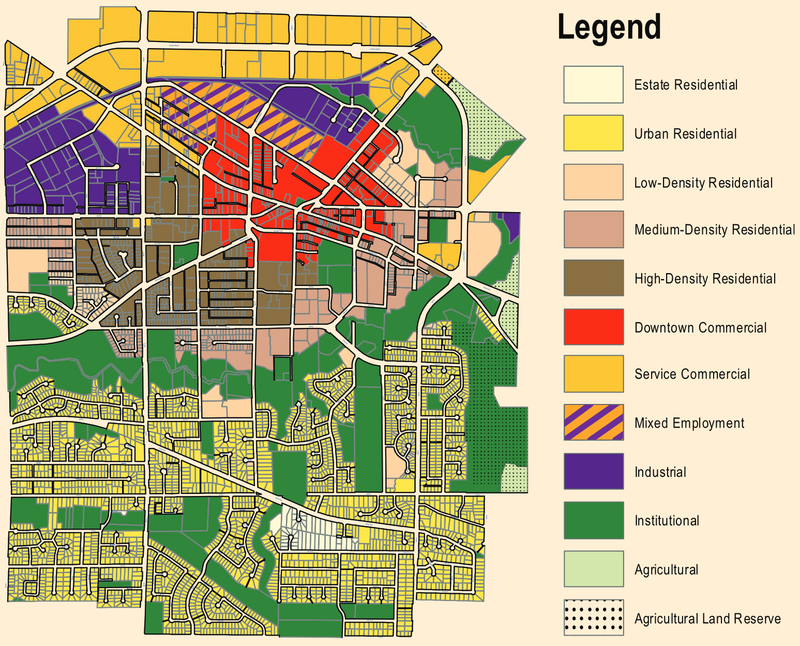 The City of Langley has defined six neighbourhoods in total. The Nicomekl River and floodplain runs through the middle of the City. 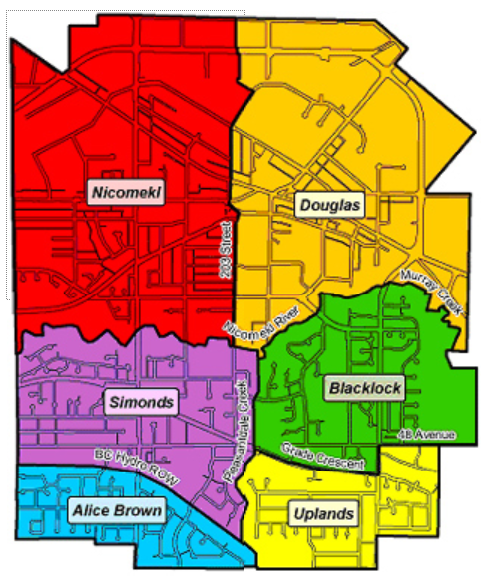 Neighbourhoods north of the Nicomekl River include Nicomekl and Douglas; neighbourhoods south of the Nicomekl River include Simonds, Blacklock, Alice Brown, and Upland. Besides being a physical separator, the Nicomekl River is also a social-economic and land-use divider. City of Langley Neighbourhoods. Select image to enlarge. Neighbourhoods south of the Nicomekl River have single-use, residential zoning with the vast majority of housing being single-family. Almost all housing was building between 1960 and 1990, and there has been very little change in the last quarter century. Neighbourhoods north of the Nicomekl River are more diverse. They contain a variety of housing options: single-family, row houses, and apartments. The neighbourhoods north of the river are also home to retail, offices, service, and industrial businesses. They are also home to the mixed-use, downtown core. Almost all development activity in the City has occurred north of the Nicomekl River, and has not been single-family housing. In fact, the amount of single-family housing in the City of Langley has remained contain. Both the Nicomekl and Douglas neighbourhoods contain the newest housing stock. Over 90% of population growth has occurred in neighbourhoods north of the Nicomekl, with the Nicomekl neighbourhood absorbing the majority of the growth. The average household income in neighbourhoods north of the Nicomekl range between $43,016 and $53,760, while the average household income in neighbourhoods south of the Nicomekl range between $89,636 and $94,916. The overall population of the City of Langley continues to age with the Douglas neighbourhood having the older population in the City. For more information about neighbourhoods in the City of Langley, you can download the full neighbourhood profiles. One of the common things I hear in Langley is that TransLink is taking money from the community while only delivering marginal services. This couldn’t be further from the truth. I looked at TransLink’s 2013 Bus Service Performance Review, TransLink’s 2013 Statutory Annual Report, plus the 2013 Annual Report from both the City of Langley and Township of Langley. What I found is that Langley actually gets more from TransLink than it puts in. Both the City and Township of Langley may be getting close to $9 million in extra services that directly benefit these communities. My calculation doesn’t include the cost for SkyTrain, West Coast Express, other regional transit routes, or other major roads that are partial funded by TransLink. In fact, I didn’t even include the 320, 341, 364, 388, or C70 bus lines that connect directly into Langley. When factoring in these additional services, Langley is getting an even better deal by being a part of TransLink. In April, I posted that transit ridership started to decline in 2013 and into 2014. This is no surprise giving the fact that TransLink has been forced to cut service* as a result of provincially mandated “service optimization”. This optimization, combined with the unwilling of the province to work with the region to come up with a long-term funding solution for transit in Metro Vancouver, is limiting the transit growth and the livability of our region. Yesterday, TransLink released their 2013 Bus Service Performance review. I thought I’d share some of the highlights from the review. 2010 – 2013 Financial and Service Performance Results. Source: TransLink Financial Planning & Translink System Analytics, Not Automated Passenger Counter Data. Select graph to enlarge. The amount of transit service hours in the region has been modestly declining over the last few years. While ridership has dropped, the amount of system boardings per service hour has actually gone up: 4 percent for the overall transit system, and 6% when only looking at the bus system. This shows that people are willing to take transit, but there simply isn’t enough service. TransLink’s transit service can't be delivered more efficiently. For the few years prior to 2013, TransLink was able to reduce service hours while still growing transit ridership. When cutting service hours results in reduce ridership, it means that you shouldn’t cut service further. 2010 – 2013 Bus Service Performance by Sub-Region. Source: TransLink Automated Passenger Counting Data. Select graph to enlarge. One of the common complaints about TransLink from people in the South of Fraser is that the South of Fraser is paying for Vancouver’s transit system. When looking at the numbers, TransLink has made the heaviest investment in bus transit service in the South of Fraser. Between 2010 and 2013, bus service hours have increased by 11%. While this is an impressive number, the South of Fraser is still playing catch-up when it comes to transit service in the region. Further increases to bus service hours —giving people the transit service they need— will require new long-term funding. In Vancouver, bus service hours have only increase by 1.2%; bus service hours aren't even keeping up with population growth. When it comes to overall ridership, the South of Fraser has experienced the highest percent growth in the region. Even while overall transit ridership has dipped, transit ridership in Surrey, White Rock, and Langley actually increased by 2 percent in 2013. In Vancouver, transit ridership dropped by 2 percent. 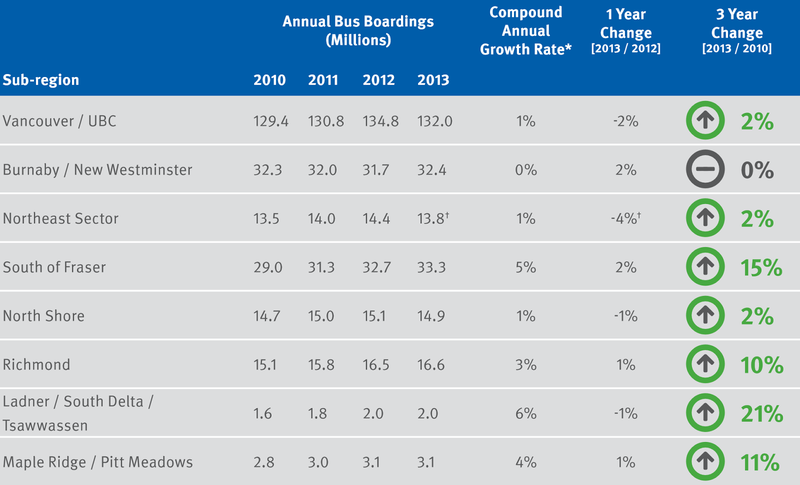 2010 – 2013 Bus Ridership Trends by Sub Region. Source: TransLink Automated Passenger Counting Data. Select graph to enlarge. 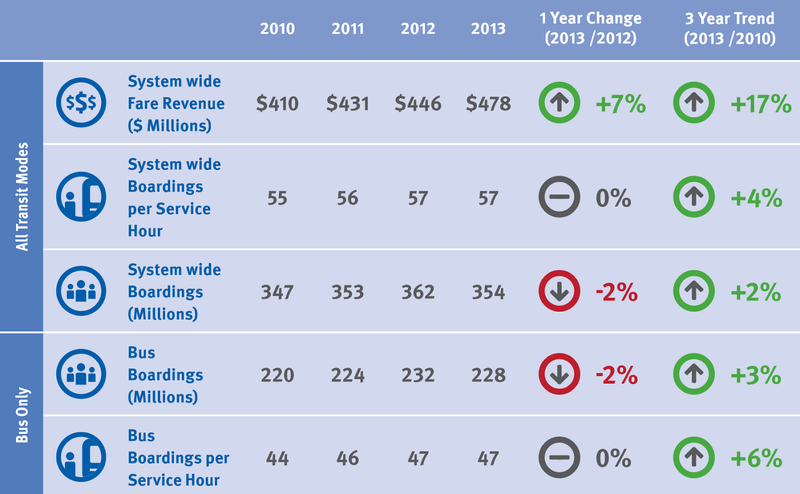 TransLink has good information in its 2013 Bus Service Performance Overview. I suggest you read the full 26 page summary for more information. *As part of TransLink's service optimization, bus service hours have been shifted around the network to better match demand. For example transit frequency has been increase along Fraser Highway, but bus service to Salmon River Uplands in Langley has been cancelled. Between 2012 and 2013, overall system service hours has decreased by 2 percent. When people think of suburbia, Langley often comes to mind. In fact, many people think that Willoughby is suburban. This couldn’t be further from the truth. The density in Willoughby is actually higher than some parts of Vancouver (which contains a far bit of single-family housing in its southern portions.) Willoughby contains commercial and industrial buildings, single-family houses, row-houses, and apartments. The areas is also seeing more mixed-use buildings. When I think of suburbia, I think of the Salmon River Uplands areas in the Township of Langley. This area contains single-family housing on ½ and 1 acre lots. Within the Salmon River Uplands area, some land is in the Agricultural Land Reserve (ALR). Because of the fragmented nature of those lots, it makes it tricky to actually have viable farming operations. As a result, the Agricultural Land Commission (ALC) generally allows land to be subdivided and excluded in the area with full knowledge that it will be used for suburban housing. The Township of Langley has also built water and sewer lines in the area which further opens up the opportunity for development in the area. One of the challenges with Salmon River Uplands is that it isn't a complete community. You need to drive everywhere with the only local shopping being the Otter Co-op. Salmon River Upland has turned into a suburban neighbourhood with very little community services because there is no vision for the area. In fact, the Salmon River Uplands “plan” is contain within the Langley Rural Plan which states it be “maintained for rural residential and agricultural uses.” That’s it. At yesterday’s Township of Langley afternoon council meeting, there was an application to subdivide a 3 acre lots in the Salmon River Uplands areas into 3, 1 acre lots. This land is in the ALR, so it needs the blessing of the ALC for the subdivision to occur. If approved, it will allow the further suburbanization of the area. Map of rural Langley with Salmon River Uplands area in grey. The subject site for subdivision is at 24907 52 Avenue. It seems that no one really wants to look at the long-term vision for Salmon River Uplands, even as a suburban community. Metro Vancouver has designated the area as “rural” in the regional growth strategy and the ALC seems willing to allow suburban housing in the area. No one want to upset the ad-hoc system that has allowed the suburbanization of the area. 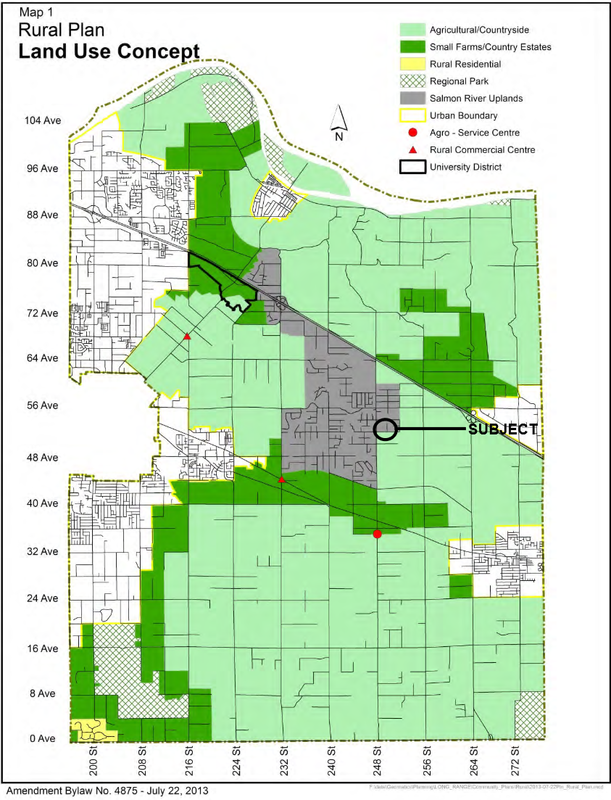 The Salmon River Uplands is a fairly large area in the Township of Langley, so at some point a plan will need to be developed to address the vision for the community, including what development should be allowed, what municipal services should be provided, and how or if the community can be accessible. Metro Vancouver has defined many town centres throughout the region as part of the regional growth strategy. Regional town centres are “intended as priority locations for employment and services, higher density housing, commercial, cultural, entertainment, institutional and mixed uses.” The idea is to build accessible, mixed-use town centres that promotes health communities, are multimodal, preserves farmland, and protests green space by limiting sprawl. Langley’s regional town centre core is the Willowbrook area which is auto-oriented and single-use. The Township does have some plans to make the area more mixed-use. For example, there is a plan to redevelop Willowbrook Mall. What I find interesting is that while the core of the Langley region town centre is very much auto-oriented, it is surrounded row houses and apartments, and now mixed-use buildings. A clear example of this is where the Township of Langley Municipal Hall is located. A Wal-Mart is directly west of the municipal hall, while a Costco is a stone’s throw to the east. This area, bounded by 200th Street, 66th Avenue, the Willowbrook Connector, and 64th Avenue, is home to big-box retail power centres. A new mixed-use project is being proposed which will be sited on the north side of 65th Avenue. This project will see the construction of two mixed-use building with ground-level commercial and upper-floor apartments. 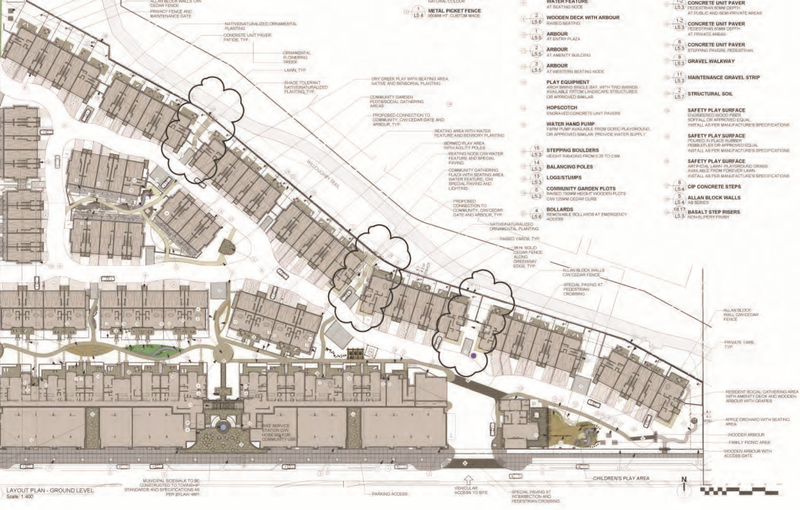 There will be townhouses north of the mixed-use buildings. Artist rendering of proposed mixed-use development on 65th Avenue near 203rd Street. Select image to enlarge. 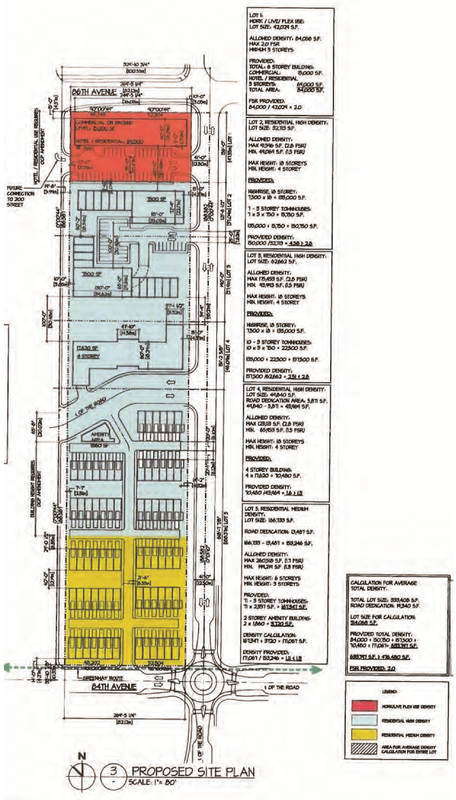 Site plan of proposed mixed-use development on 65th Avenue near 203rd Street. Select image to enlarge. There is a public hearing tonight about this project with more information that can be downloaded from the Township’s website. This is a great project and it will support the creation of a walkable and accessible community. What is interesting is that the north side of 65th Avenue is slowly become a mixed-use “high street” while the south side of the street is fronted by the rear of the Costco building. While the area around the Langley regional centre is becoming more mixed-use, it seems that the core of the regional town centre is still very much auto-oriented. Single-use, auto-oriented projects are still being approved in the regional centre. The Township needs to review its plan for the regional town centre and look at how it can support building an accessible community. 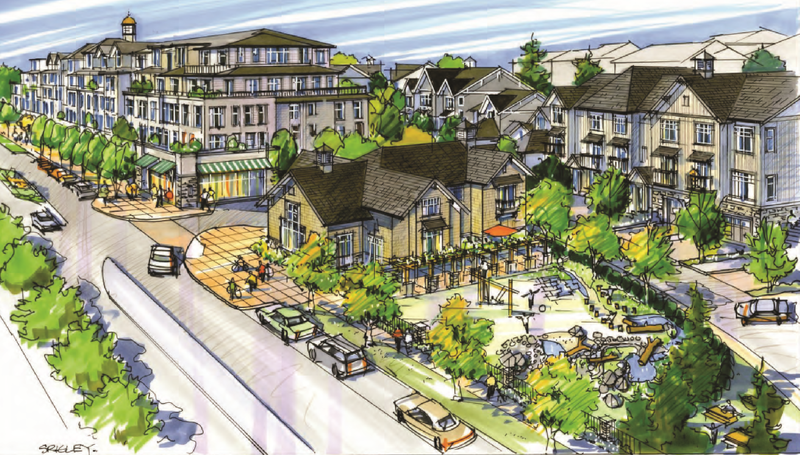 The core of the regional town centre needs more mixed-use projects like the proposed 65th Avenue project. TransLink has had a tough go of it in the PR department when it comes to the roll-out of the Compass Card system. The Compass Card system is really two parts: the modification of SkyTrain stations and two SeaBus stations to handle fare gates, and the roll-out of a smart card payment system. One of the major issues I have with the Compass Card is that the Provincial Government forced TransLink to install costly fare gates. The Province wanted the fare gates as they calmed it would reduce fare evasion, maybe hoping this would fund some of the much needed transit expansion in the region. Sadly when it is all said and done, the fare gates will cost more to operate than the revenue that could possibly be recovered from reduced fare evasion. The actual Compass Card smart card payment system, on the other hand, is a great idea as it will enable greater payment flexible for transit users, make the system easier to use, and provide accurate data about transit usage in the region. While I’m excited about the introduction of the Compass Card, maybe a bit more than the average person; by the way the roll-out of the Compass Card has been portrayed in the media, you’d think that transit service is being impacted by the delay in fully launching the system. The reality is that nothing has changed with how to use, or pay for, transit for the vast majority of transit users. You can still pay by cash, debit, and credit card. You can also still buy day passes and monthly passes. One of the issues that is worth monitoring is the cost of the overall Compass Card program which changed from $171 million to $194 million. This is a difference of $23 million or a 14% increase of the total budget. Of that $23 million increase, about $9 million is due to the smart card readers on the bus. From my understanding, the performance of the bus smart card readers is what is holding up the launch of the full system. TransLink is claiming that $194 million is all then need to complete the Compass Card program though they won’t commit to a timeline. From personal experience with IT projects I’ve worked on, when you have to write software, deploy software, test software, and fix bugs in software, it can be really hard to put an exact date on things. When it comes to a system like the Compass Card, I’d rather have a rock solid system from day one, then a system that is pledged with bugs and glitches. As long as the Compass Card program remains within this new budget, I happy to wait for my Compass Card. Considering I’ve been using a paper monthly pass since I’ve moved to Metro Vancouver, I’m not too concerned if I have to use it a little bit longer. Safe streets and a public realm where people feel comfortable are a result of good urban design. Good urban design means building public spaces that support natural surveillance (eyes and ears on the street), promote a sense of ownership, are clean and beautiful. An example of this would be a main street with mixed-use buildings that have ground-level retail and housing or office space on other floors. Besides having retail that is open during normal business hours, businesses that are open later, like restaurants, coffee shops, and even pubs, need to be a part of the mix. The goal is to make sure that there are always people around that make it hard for illegal and undesirable activity to occur. Another important thing is to make sure that the public realm is in a state of good repair. This means fixing vandalism and cleaning up tagging right away. Maintaining the public realm sends a signal that the community is safe and discourages undesirable activity. There is a whole field of study called Crime Prevention through Environmental Design on which many books have been written. Downtown Langley has some issues when it comes to creating a good public realm. One of the issues is that there are no eyes and ears on the street during some parts of the day; most businesses in the downtown core shut down by the early evening and there are not many mixed-use building in the core. Further, the vast amount of parking lots further reduces creation of a public realm that encourages desirable activity. There are some design issues in many public spaces that need attention. Unfortunately, the City of Langley is looking at band-aid solutions to clean up the bus exchange and Innes Plaza. With the bus exchange, there are many issues; one of the many being that it is a TransLink facility. This means that the City is unwilling to continue investing in even the simple things like upgrading the lights. TransLink is planning to move the bus loop. Because of the pending move and City Council's unwilling to spend more money on a TransLink facility, the bus loop will continue to feel unsafe to many. City of Langley staff recently recommended that the following be done to improve the perceived safety of Innes Plaza. City Council approved this recommendation, but I have to wonder if video surveillance will really reduce crime or make people safer. For example, all TransLink buses and the SkyTrain system already have cameras. While cameras can help after-the-fact, they certainly don’t make me feel safe when I’m the only person at a bus loop at 10pm at night. Improving the lighting and sight lines to Innes Plaza is a good move by the city, but the real missing component is to create a public realm that encourages “legitimate” use of an area which will discourage undesirable activity. I fear that the massive parking lots surrounding the plaza will limit legitimate use; the parking lot will need to be transformed to a better use before Innes Plaza is truly successful. While I’m happy that the City of Langley is trying to clean up the public realm, the solution is less about technology and more about designing a desirable public realm. Strava is an application platform that allows people to track their bicycle rides and runs. Strava is available on iPhone, Android, and select GPS units. The platform offers both a free and premium membership. The platform is popular among cyclist and runners as it allows them to set goals, view detailed maps and analyze past activity. It also includes a social component with the usual share features and leaderboards. As you can imagine, Strava has a lot of useful information about where people go. This information is extremely useful when planning for active transportation infrastructure in communities. Strava has maps based on this data available online at labs.strava.com. Called Global Heatmap, it allows you to drill down and see where people cycling and run (or not). Strava also offers more detailed data at metro.strava.com. This data can be plugged into GIS mapping systems. GIS is used by urban and transportation planner. With this high-quality data, planners can better plan for active transportation infrastructure. Strava Global Heatmap for cycling in the South of Fraser. Select map to enlarge. As an example, the Greater Langley Cycling Coalition had to advocate heavily to get the Township of Langley to include 0 Avenue in that community's cycling network. While the coalition knew that this was one of the most population cycling routes in Langley, information from Strava could have confirmed this local knowledge quickly. The Global Heatmap shows that indeed 0 Avenue is one of the busiest routes in the community. When looking at the Heatmap, it becomes clear that the City of Langley is a bit of a black hole for cyclist. The City of Langley, for example, could use this information to plan where to build cycling infrastructure to encourage more cycling. One of the challenges with the Strava dataset is that it skewed away from commuter or casual cyclists, as the platform is geared towards more hard-core riders. Also, the information provided by Strava is less likely to include data from people with lower incomes as they are less likely to use platforms like Strava. 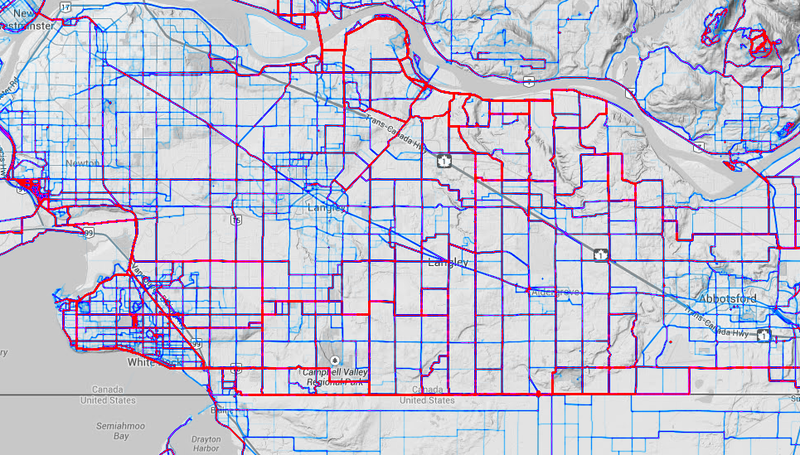 These shortcomings aside, Strava’s dataset is extremely useful and should be a part of every planner's toolkit in the South of Fraser as it can be used to help encourage cycling and walking. If you’ve been around Downtown Langley lately, you’ll have noticed that there is a proliferation of pharmacies. In the last several months a Shoppers Drug Mart, Pharmasave, and IDA have opened or will be opening shortly in Downtown Langley. It is almost to the point where you could walk blindfolded and end up in a pharmacy. Langley City has a larger than average seniors population and also a larger than average population of people who live on lower incomes. Even with a large population of seniors, I found it a bit odd that Downtown Langley could support so many pharmacies. It turns out that filling prescription may not be the primary profit generator for these pharmacies. Langley City Council received a letter from the Downtown Langley Business Association expressing concerns about the recent influx of pharmacies in the area. The Downtown Langley Business Association would like City Council to consider taking actions to regulate pharmacies in the area. One of the things City Council could do is prevent further pharmacies from opening in Downtown Langley, but they couldn’t prevent current pharmacies from operating. Downtown Langley will have 13 pharmacy in operation shortly; a moratorium to prevent further pharmacies may be worth considering, but the City, the Downtown Business Association, and current pharmacy owners will need to work together to address the three listed concerns. Monitoring loitering and illegal activity in Downtown Langley will certainly need to be part of any action plan, but this will cost money. The trick will be for all three parity to work together to address these concerns without place too much extra burden on the City's already tight operating budget. My dad uses a walker when at home and uses a scooter when going around town; one of my best friends is a full-time wheelchair user. Because of this, building an accessible community hits particularly close to home for me. For all people, building a community that supports living with dignity and independence is critical. It is no surprise that many people with limited mobility choose to live in Downtown areas with shops and services within a close walk or wheel. For example, my parents live in Downtown Kelowna. My dad’s highlight of the day is when he can scooter down to the local coffee shop and chat with other people in the community. While he lives in Kelowna, this same type of activity happens in Downtown Langley. When the IGA in the Langley Mall closed down, it impacted the quality of live for many people with limited mobility in the area, as they lost an easily accessible place to hang out with others in the community. They also lost a place to shop for basic needs. Because the two remaining grocery stores in the City of Langley are at the far ends of the community, the Langley Senior Resources Society and one of the remaining grocers partnered to provide a limited shuttle service. Of course even with a shuttle, people’s independence and quality of life has suffered. A "No Frills" has now replaced the IGA. Having had to deal with para-transit services like HandyDart directly, as well as other similar services, I can tell you that it isn’t a panacea for independent living for people with disabilities. With a HandyDart type service, you basically have only very limited service that can get you to the doctor, for example. Also, traveling on HandyDart can be a humiliating experience. With the massive service cuts to HandyDart, this service is getting worse. Many people thing that taxis are the solution. While taxis certainly play an important role in providing independence for some people, they are expensive. Also, many taxi drivers are ill-equipped when it comes to providing service for people with disabilities, which can lead to a less-than-dignified experience. Driving is not an option for many people with limited or no mobility. Many people, due to a disability, are on a fixed income, so owning and operating a car is not affordable. For those that can afford to own and operate a car, it can be inconvenient or unsafe for them to drive. When I talk with people with limited mobility about how communities should be designed, I hear a few common things. One is that shops, services, and social opportunities should be close to where people live. On street design, sidewalks need to be in a state of great repair. Sidewalks should be wide, smooth, and have proper curb letdowns. Also, streets need to have closely spaced benches to allow people to rest, if need be. It is no surprise that many seniors and people with disabilities choose to live in Downtown Langley due to its walkability, which supports an accessible community. This is why building a walkable Langley is important to me. When building an accessible, walkable community, the construction of drive-thrus should be strongly discouraged. Not only do drive-thrus promote pollution-causing idling, but they also promote driving which encourages unhealthy communities. Most drive-thrus also detract from the public realm. Shops that front the street with good sidewalks promote active transportation in communities, especially if these streets are close to townhouses and apartments. Parking lots and drive-thru break up the street front which discourages walking and cycling. This is why I believe that new drive-thrus should not to be allowed in Downtown Langley as the City’s stated goal is to create a pedestrian-oriented core. 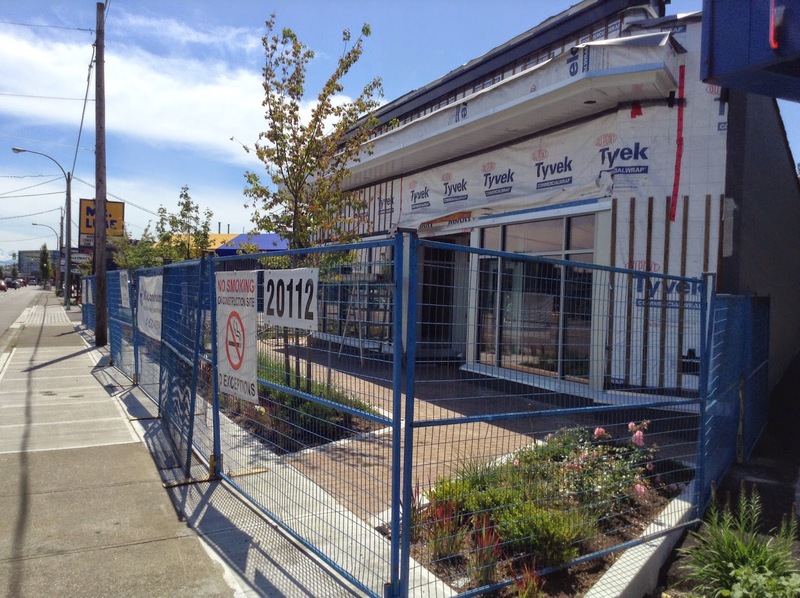 Back in 2012, I posted about a new coffee shop with a drive-thru project that was proposed along Fraser Highway on the western edge of Downtown Langley. I was disappointed that City Council approved a drive-thru. Construction of this project did not start until recently. This morning, I walked by the project to take a few pictures. 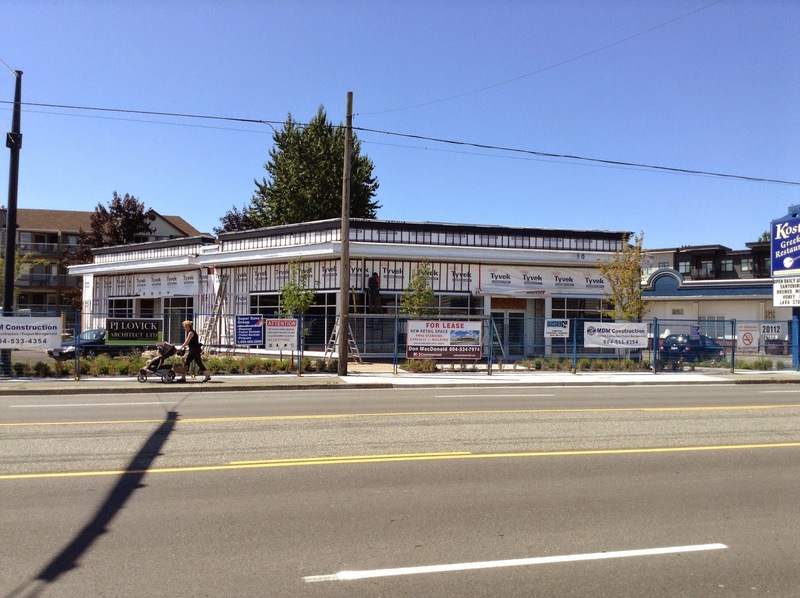 New project at 20112 Fraser Highway. View from the sidewalk. View from street, new building at 20112 Fraser Highway. I was pleasantly surprised to see that the drive-thru component of this project was removed. In fact, the building fronts Fraser Highway and is pedestrian-friendly. As Downtown Langley continues to develop, we need more projects that encourage and support a pedestrian-friendly public realm. I’m glad the drive-thru is missing which means that this project will now help build a health and more accessible Downtown Langley.